It’s not too late to plan a family reunion in Park City, Utah this summer. It’s also not too early to start planning for next year. Park City is one of the best places in Utah to find lodging and activities for everyone in your family or group. I recently had the opportunity to sit down with Jana Brown, National Group Sales Manager for the Park City Chamber/Convention and Visitors Bureau. I learned that her office is ready and eager to help you plan your next family reunion or group getaway. Lodging, activities, group meeting facilities? Her team can help you find exactly what your family needs to plan a memorable event. Even better, it’s a free service provided by the Park City Chamber/Bureau. I asked Jana a few questions about Park City during our visit. Here’s what you need to know about planning a family reunion in Park City. 1. It’s common knowledge that Park City, Utah is a world-class winter destination. What can families expect in the summertime? There is even more to do outdoors in the summertime. Park City was voted the Best Town Ever by Outside Magazine in 2013. All three of our resorts – Park City Mountain Resort, Canyons Resort and Deer Valley – have fun summer activities for families. Park City is ideal for this age group. All three of our resorts have hiking and biking trails and chairlift rides to get you to the top of the mountain to hike or bike down. Park City Mountain Resort has horseback riding, miniature golf, bungee trampoline, alpine slide and zip lines. Deer Valley has summer concerts on their mountainside at Snow Park Outdoor Amphitheater. Canyons Resort offers paddle boats, zip lines, catch and release fishing and concerts in their village area. In and around Park City, families can find free concerts in the city park, golf, river rafting, fly fishing, water sports, and ATV rides. 4. What activities do you think less-outdoorsy family members will enjoy? Park City’s Historic Main Street has over 100 restaurants with indoor and outdoor dining, galleries, specialty boutique stores and the History of Mining Museum. Park City has two other museums and historical walking tour as well. Scenic chair lift rides are offered at all three resorts and Main Street. For those who enjoy shopping, Park City is home to eight different shopping destinations. Canyons Resort hosts the Park City Farmers’ Market every Wednesday from noon – 6:00 p.m.
5. Park City is home to several Olympic venues from the 2002 Winter Games. What are the best ways for families to experience Park City’s Olympic Legacy? Utah Olympic Park is an especially good place to catch the Olympic spirit. It offers two museums, one about the 2002 Winter Olympics and another about the history of skiing in Utah, both in the same building. 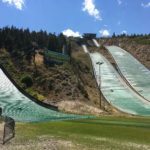 Utah Olympic Park also has interactive rides, zip lines, alpine slides, and bobsledding. The Flying Ace Freestyle shows are a popular Sunday event. Park City has a wide array of lodging options for groups. There are many vacation homes and condos in the area for rent. Park City hotels range from budget chain hotels to boutique inns such as the Washington School House. Park City can accommodate any budget, from luxury five-diamond hotels to Park City RV Resort. I would be able to help place your group with whatever works best for you. Park City has something for everyone. Every type of dining is offered in every neighborhood within the seven miles of Park City. Private dining is available throughout Park City, depending on your needs. Park City is 35 minutes away from the Salt Lake City International Airport, via Interstate 80. 9. What services does your office offer to large groups? We offer many services to groups, including immediate response and help with lodging, private dining, non-traditional venues etc. The Park City Chamber/Bureau is here to make your experience and stay in Park City unlike any other destination. 10. What tips do you have for families on a budget? Use the local Chamber/Bureau to help you plan and plan early. The further out to your selected dates, the better pricing you will find. If you are interested in planning a family reunion in Park City, contact the Park City Chamber/Bureau at [email protected] or (800) 453-1360. You can also find more information and request a planning kit at www.visitparkcity.com. Want more Park City ideas? Here are the family activities we recommend in and around Park City. Note: All photos are copyrighted and may only be used with permission from the Park City Chamber of Commerce/Visitor’s Bureau.